It has indeed been a while since I've been on the boards, but I'm back today because I want to get people involved in something. I'm building a vehicle and I'm calling it Project Streetliner. What it is: It's a tilting 3-wheel commuter vehicle based on modern scooter running gear. 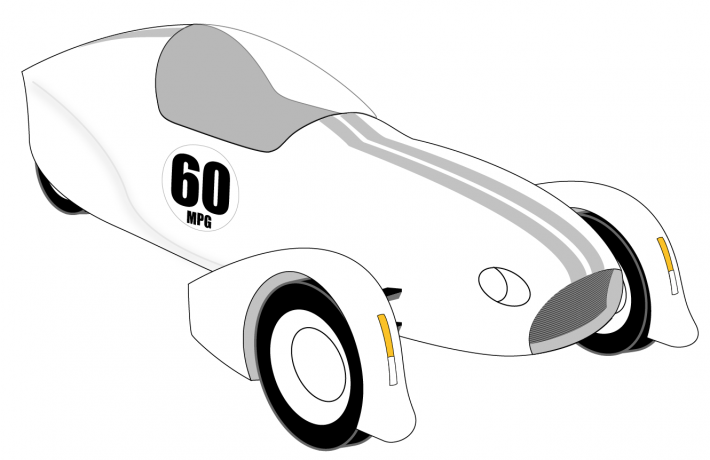 Picture a recumbent Piaggio MP3 with a fiberglass streamliner body on it. It'll be single seat, but hopefully incorporate a good amount of luggage space. I want to build either a roll cage or F1-style safety tub into it for some basic safety and include a 5-point harness. You can read my initial synopsis here. What it's not: It's not an all-purpose vehicle. It's not for passengers. It's not a hot rod (although I intend for it to be highway capable). It's not a touring vehicle. It's not a replacement for my Vespa. It's not being developed for sale or market. It's not top secret. In fact, I want to do as little original thinking as possible. Where you come in: I want this to be a collaborative, open-source project. Though this won't be a scooter in finished form, it will use a lot of scooter components and I want it to tap into as much scooter practicality and mojo as it can. I want it to be a convergence of lots of ideas. I want it to be something that someone else might see and take in a totally different direction if they wanted to. So I'm opening it up to anybody who's interested. How to get involved: You can keep up with the project on ProjectStreetliner.com. But more than that, you can submit ideas or even just related stuff you find online directly to the project via this submission form. Thanks for your input! Find your self a crashed/salvaged MP3 500 and pilfer the motor and trans including all associated electrical components. That would be a heck of a power plant. I was thinking wrecked MP3 400 or 500 myself. That's the only way it's going to be under my $10k budget. I had also thought that the power plant out of a Silverwing or a Burgman would work well also. One advantage of the Piaggio power plant is that I could easily substitute a larger rear wheel off of the Aprilia SportCity and effectively gear it up higher without having to touch the transmission. As for the harness, it's a necessity if the cabin will be enclosed. It's likely that the body will open up like a funny car or something similar, so "ditching" isn't much of an option and banging around inside the cabin is just a great way to get hurt. Were it just an open vehicle like a scooter, then sure, I'd want to be able to step out of it, but that's not the concept. Besides, it'd be pretty tough to vault yourself out of the vehicle lying almost flat on your back in a recumbent posture. The cabin idea has a lot to do with racing. A properly constructed steel safety cage or composite "tub" is able to protect occupants in horrific, triple digit crashes. I'm not looking to hit quite that level of protection, but some basic cabin protection structure plus a sturdy seatbelt across both shoulders would mean enough basic safety capability that this would be a vehicle I wouldn't have to suit up to drive it. I could just put on a helmet and go. Think F1 or Indy car. The Burgman and Silverwing ideas are good too. The main reason I suggested the MP3 is that it's fuel injected. That'll eliminate trying to tune the carb to such a vehicle. It'll also up fuel efficiency and emissions. That's good thinking. I am pretty familiar with the Piaggio mechanicals too. The one advantage to say a Silverwing engine would be that Honda dealers are much easier to come by across the country. Although, the vehicle is meant for A to B work commuting, not touring, so nationwide part availability is probably a non-issue. Spoken like a man who's dealt with the Piaggio/Vespa parts department. I'd look for the front suspension components and the low speed/stop tilt lock as well as the engine. I'd make it a top entry with a sliding canopy, or hydrolic assisted canopy that opens towards the front of the vehicle. The seat should be like a race bucket with the high sides and through the back 5 point harness threading as well as reenforcement around the shoulder area. If you're building it from scratch, you might want to incorporate a dual headlight design as well as getting the beefiest stator you can in which ever drive train you choose. Being in a cockpit type vehicle is going to make you want to load that thing up with power hungry gadgets and the like. There's also other projects on a similar concept. The one that sprang to mind is the "Carver" which was featured on Top Gear (Series 2, episode 9) as well as this one which takes the "Carver" concept and goes a little farther. That's exactly what I was thinking. I've been looking into a number of recumbent trike bicycle designs as well as technical diagrams and CAD renderings of the front end of the MP3. Most use essentially a section of brake rotor and a caliper to lock the tilt mechanism, and that's just what I intend to do. The key difference being that on the MP3, it's been electrified and "idiot proofed" to only work at certain speeds and situations. I plan to use scooter hand controls, which would mean my feet don't have anything to do � so that means a perfect opportunity for a foot pedal, on demand tilt lock. That'd also let me use basically a parking brake assembly as well to lock the tilt for parking. I'm of several minds when it comes to entry and wind screens. The original kernel of this idea was to be an F1 or Indy car arrangement with a minimal windscreen and full face helmet. I don't want to completely lose that open-air scooter experience. I want to add a lot of aerodynamic efficiency, but it's not a sacred cow on this concept. However, I would like to be able to drive the vehicle in nearly any weather. So it may be that some sort of removable or convertible roof is in order. I'm still figuring all of that out. If I've got the helmet on, maybe it's as simple as a neoprene tonneau cover like a lot of the Velomobile riders use. That's just what I was thinking also. That's going to add a lot of protection right there and having it anchored into at minimum a roll hoop and composite tub should make for a cosy, safe cockpit. What I love about using race spec or nearly race spec equipment is that it's all already designed to be as light as possible. Instead of trading weight for speed, I'll trade it for efficiency. I'm not sure if I'll be able to beef up the stator or not, but I imagine it'll at the very least have a much beefier battery. I'm not particularly looking to get super gadget happy in the cockpit, but I do plan to have power hookups for perhaps a heated seat/grips and one or two accessory jacks for GPS. I won't be putting a stereo in it or anything, I don't think. I've seen this vehicle a lot lately, but there are quite a few complexities that make it a poor candidate for my project. Chief amongst them the complexity of 2-wheel rear drive and the powered, actuated leaning. I want to stick to a counter-steer lean like a bike if I can. Think about a removable "foul weather top" ala Jeep. Might give you the best of both worlds. You can eliminate the need for electrical heat sources since you're going to be in a fairly wind protected environment. You can actually help the heating aspect out by taking engine placement and, more specifically radiator placement into consideration. Along the same train of though, if you don't design in some sort of fresh air ducting to the cab area, you'll suffer heat stroke on days above 90 (large displacement engines get hot). An open cab in the warm months will be a necessity since I'm assuming you probably won't be piping refrigerant into it. You'll want to be especially thorough in your tilt lock solution. Since you'll be encased, you won't be able to put your legs out to prevent a tip over should it fail. Keep that in mind if you end up doing side doors... you'll want one on each side just in case of an incident described above. It's tricky, figuring out where to draw the line between open and free and smaller cage. I'll be keeping an eye on this one. Very neat stuff indeed. That's definitely the front running concept right now. Perhaps a permanent tonneau cover that stays with the vehicle for getting caught in the weather and a removable hard-top canopy for days when I know it's gonna rain. You can eliminate the need for electrical heat sources since you're going to be in a fairly wind protected environment. You can actually help the heating aspect out by taking engine placement and, more specifically radiator placement into consideration. I'm sticking with liquid-cooled engines for this very reason. I'm thinking a front-mounted radiator and then probably harvest an actual heat exchanger out of a small car and pipe warmed air into the cabin. But I'd definitely want to be able to turn that on and off. Also, I plan on an insulated firewall between my backside and the engine compartment and plenty of vents that can be opened up in the bodywork for hotter days. Some sort of heating will definitely be necessary though. This is Minnesota, after all. That's good thinking on side doors! I hadn't thought of that. I imagine that the exit will be through the top more likely than not. As for the tilt, I think the best approach will be to have a significantly wider stance up front than the MP3. The tilt will still move the CG for dynamic stability during turns, but if I push the wheels out even just a little bit, getting to a place where even at full tilt the vehicle won't just topple over should be attainable (being a recumbent form factor helps this tremendously also). That way, even if I had to stop in the middle of a deep lean, the tilt lock could effectively "catch" the vehicle the way your feet do riding a scooter now. That also opens up real possibilities for winter driving (not during snow or anything, but dry winter driving). This project reminds me of one that fascinated me back in my collage days. 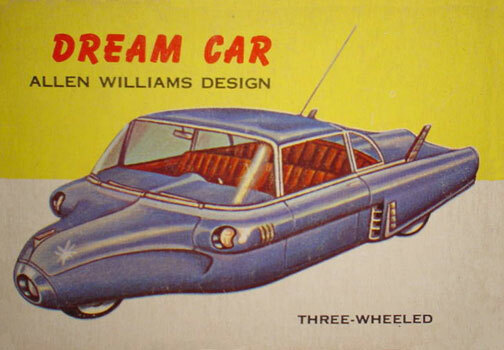 Mother Earth News designed a three wheeled tilting vehicle based on a motorcycle drive train. They even developed a tilt system. It was in the September/October 1983 issue of Mother Earth News. I found a link that refers to it. You might get some ideas from it. Good luck. I always wanted to do something like this but it is a little too much for me. �as well as this one which takes the "Carver" concept and goes a little farther. The Venture is now called the Persu Mobility (http://flytheroad.com/). Unfortunately, production has been delayed on this a couple of times. I'm not sure exactly what happened. They had a round of online focus groups to help finalize the redesign of the cockpit and canopy. They changed the name from Venture One to Persu (due to a trademark conflict, I think). Then the forum on the site was shut down and the flow of news and updates just stopped. The owners had been great about communicating with enthusiasts and members of the site but seemed to just disappear into a hole a year or so ago. Could be they lost their funding. Could be, like a lot of startups, they're riding out the storm. Could be they hit some engineering snags. Could be it's gone from promising project to vaporware. I don't know but I do know that I was seriously considering getting one of these instead of a car a couple of years ago. I'm still hopeful they'll eventually be available. Although we tried a number of different mechanisms in our efforts to find a system to induce camber in the car (because it has more than two wheels, it can't lean natural ly like a motorcycle), only a handful proved successful. The "inclination" is at present controlled through a combination of mechanical, hydraulic, and electronic components ... all of which are available as "off the shelf" equipment, and some of which are so basic that they're commonly used in many toys and pocket calculators. It'd be ideal, for example, if the lean system were a stone-simple mechanical affair with a minimum of moving parts, but research showed us that such a design has some real drawbacks . . . one of which is that it takes almost superhuman force to initially lift the vehicle from the full-bank position. That's why we use hydraulics. Looking at what photos I've been able to find, two things stick out to me as to why this would be the case. First, their front suspension is very narrow top to bottom. This would mean a really narrow parallelogram for the chassis to pivot on and the cambering force of the wheels would be at a mechanical disadvantage. Were the suspension arms the full height of the wheel, for example, then the leverage would be much greater and the ability to right the vehicle with simple mechanics could be restored. Secondly, their vehicle is a lot taller than what I have in mind and the seating (and therefore the CG) is much higher. That would require more force to right the vehicle from a lean. So the recumbent layout of what I have planned should help that as well. This is why I am trying to gather up as much info as I can and do scale prototypes like crazy before building anything full size. No telling how lost I'd be without everybody's collaboration, so thanks so much to everybody who is getting involved. Wow, I can't wait to get my hands on one of these. I saw a video of one earlier this year, and all I could do was stare and say, "Wow"... it could revolutionize driving in America, which sorely needs to happen here. There are sooo many a$$hole drivers her in SUVs and other big vehicles (I call them gas-holes) that it is just sick. The automakers really need their hands slapped for doing things like the Hummer, etc... the people that drive these things are always on their cellphones and disrespect 2-wheelers so badly. I definitely think that the more people explore the possibilities of what a car can be, the more and the better options we're going to have in the market. But no need to wait for them to catch up in the mean time! I definitely think that the more people explore the possibilities of what a car can be, the more and the better options we're going to have in the market. Have you considered fins and two rows of bench seats? Two rows? Why not three? That might be a tad excessive. this reminds me of a company called aptera. they have an amazing project going. the vehicle they produce is a side by side for passengers and does not lean. but pretty cool none the less. The Aptera is a very cool vehicle indeed. They're front runners for the automotive X prize competition. I draw particular inspiration from their composite safety shell. Quick update for everybody. The project has grown so much that it now has its own website. Check out http://www.projectstreetliner.com for all the latest updates and do please participate in the comments section. I want all the collaboration I can get! Utilize the handy RSS feed and follow the updates as they happen. The Tilting Motor Works guy had worked out a nice simple system that worked and I thought he was about to go into production, but haven't heard from him in a while. Check it out, though, you could almost bolt up a running prototype chassis using his existing front end..
Yeah, I've been in touch with Bob at TMW. His front end is very similar, but his kits are not yet on the market and he's looking to get $10k just for the kit. That's my entire build budget. Besides that, I will need to build the front end to some pretty exact width specs. So I'll be fabricating my own so that it's just what I need. Thanks for chiming in! That triked Yamaha just doesn't do it for me... something about the way the linkage is setup screams inelegant to me. NS, I'm diggin the old roadster look. I saw that the length and width are ending up to be quite a bit larger than you had originally expected. You're about at regular car size. The motorcycle classification will help alot with any roadblocks for registration and such, so that's a plus. Have you considered altering the seating position to regain a slighter footprint? I've thought about it, but want to minimize frontal area as much as possible. 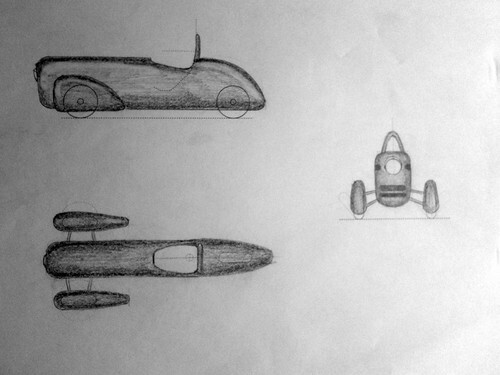 If I do a tandem two-seater follow up, it'd probable be reconfigured a bit taller to get the passenger up over the motor. But for now, I'm comfortable with the length as it will mean quite a bit of stability. Looking at what photos I've been able to find, two things stick out to me as to why this would be the case. First, their front suspension is very narrow top to bottom. This would mean a really narrow parallelogram for the chassis to pivot on and the cambering force of the wheels would be at a mechanical disadvantage. Were the suspension arms the full height of the wheel, for example, then the leverage would be much greater and the ability to right the vehicle with simple mechanics could be restored. That's true, but as you make the vertical dimension of the parallelogram larger, you also increase the mechanical advantage the outer arm will have if it has a disk brake caliper attached to it. The effect will be that when the brakes are applied, the force will attempt to twist the two horizontal arms of the parallelogram into a double helix. I see what you're saying, but the swing arms are not just single rods of steel. They're actually triangles with much wider attachment points at the chassis. Sure, those members will need to be reinforced laterally, but the basic geometry of that arrangement should overcome any twist induced by the brakes. I'd also argue that if the radius of the caliper were inside the radius of the swing arms then it would actually be at a mechanical disadvantage in terms of twisting the structure. Maybe this photo will help clear things up. It's the front end off the Brunelli Leanster, and pretty much verbatim what I'll be fabricating, I think. If you look at this, the radius of the brake caliper is actually greater than the distance between the swing arms, so if there were going to be a twist problem, this one would have it big time. In the end, the distance between the swing arms is decided by the clearance inside the wheel. At full lean, you start to really have to be careful about the interaction of your swing arms and the inner edge of the wheel rim. That's why this suspension also features a solid bar that keeps it from leaning over too far and binding the suspension up in the rim. Nice! I like the looks of that. Yeah, I'll be building that in miniature using brass tubing and solder here in the next few weeks. Excellent. I'm very keen on this tilting thing, but concerned how a recumbent rider in your machine will be able to tilt the machine to corner if they can't shift their weight. P.S. I have so many questions because I am a failed tilting designer. I thought I had come up with a way to convert the front end of a Buddy to tilting scooter using only one part, an axle shaped like a stairs with three "steps". This would make the bike a tilting three wheeler using just one part (assuming the axle would ride in a bushing so it could turn). I thought I was clever for about a second until I realized there wasn't a way to make a brake work. P.P.S. I am also a huge fan of the old Morgan three wheelers. Lov'em, even though they don't tilt, of course. A-Hah! That is what's been nagging at the back of my mind! I thought something was off, but I couldn't think of what it was. You might have a solution for this, but I just can't see it in my head. The short answer is that it's the same way a recumbent bicyclist is able to lean and steer: through counter-steering. Scooters are light enough that you can induce a lean by throwing your body weight around, but larger 2-wheelers are not. So riders use what's known as counter-steering, even if they don't actually know that's what they do. It's very intuitive to our bodies when we ride, but cognitively complex if you're not familiar with the physics of rolling objects. For example, if you're riding a 600 lb Honda Goldwing you're not going to be able to lean it with your body weight alone. Leaning your body into the turn is still ideal because it puts your body weight (and therefore the center of gravity) toward the inside of the turn, but this does not actually cause the bike to lean. Counter-steering uses the angular momentum of the wheels (the force generated by a spinning object that resists motion against its axis of spin) to induce a lean in that wheel. Angular momentum is what causes a two-wheeler to stay upright in the first place (by resisting the force of gravity). You're not really balancing it yourself once it's up and rolling. A spinning wheel's reaction to an outside force is an effect called "precession" that reacts at 90� opposite to the input force. In the case of a motorcycle or bicycle (or scooter), when you turn the front wheel from above (on a vertical axis through the fork and the handlebars), you exert an exterior rotational force on the spinning wheel. The angular momentum of that wheel resists that force and in essence redirects it at 90� opposite � which leans the wheel (and the bike with it) along the horizontal axis. This is why in the MSF manual it says to "push left to lean left." By pushing on the left hand grip (in essence turning the front wheel to the right), the angular momentum induces a lean in the opposite (left) direction. To come out of the lean, you push right to lean right. Obviously, as you go through the turn your body position and steering input have an effect on the lean angle and the turn path of the vehicle, but it's this property that causes the bike to lean in the first place, not your body weight alone. Try it sometime on your scooter, it works just the same there. In fact, you can lean the bike over without using your body weight at all � just through counter-steering. This is less than ideal as a combination of the two gives you the greatest control, but it demonstrates the principle. 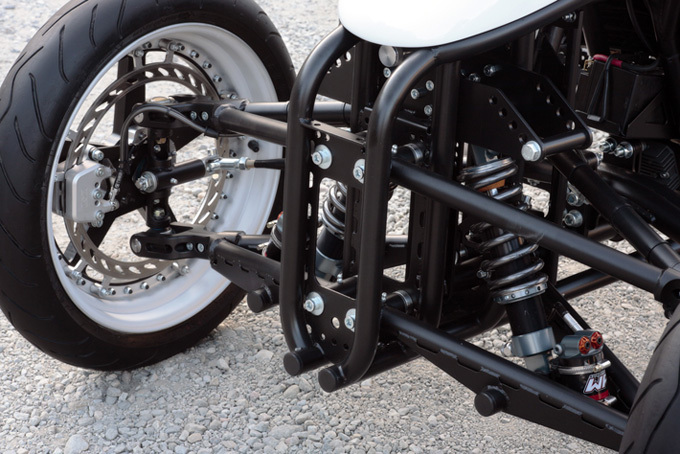 This works no differently on a 3-wheeler, if the suspension will allow the tilt. By steering the front wheels, those wheels redirect that force into a lean. The Piaggio MP3 works this way, and so will my vehicle. The reason, I think, that so many larger 3-wheel vehicles like the Carver utilize hydraulics to move the body around is precisely because people who don't ride motorcycles don't understand the idea behind counter-steering. If they're presented with a steering wheel and in essence expected to turn the wheel right and then back left again in order to complete a left turn, that's a pretty steep learning curve. That means it's a vehicle that any John Doe can't just get in and drive and that's bad for sales. So they use computer controls and hydraulics to induce a lean. That's all way too complex and definitely not in the spirit of this project. The controls will essentially be a small set of handlebars, and it won't be something that just anybody could get in and drive. One further thing that might interest you is that there will be an on-demand tilt lock. That is, I'll be able to lock the vehicle upright at any time through a foot pedal. I won't be able to put my feet down, so this will be essential at stop lights and while parking and such. It'll be especially handy while tooling around parking lots and that sort of thing. I'll also be giving the vehicle a wide enough track so that if I were leaned over and had to stop suddenly � say I was turning through an intersection and the car in front suddenly stopped � the whole thing won't topple over. Since I'll still have control of the steering, I'll still be able to maneuver and as soon as I have just the tiniest bit of speed, I'll be able to counter-steer back out of the lean. Does that clear it up at all? One thing I'm making sure of in my small-scale prototype is that my understanding and application of all these principles is correct. If it didn't work this way, then the MP3, the TMW, and the Leanster wouldn't work. I suppose it's the angle of the steering input that's making it so hard to wrap my head around. With a saddled bike, the forks are at about a 70-80 degree angle to the chassis. When the forks turn, the wheel pivots along that same axis, which is close to being perpendicular to the road surface. It's part of what makes counter-steering so intuitive. The angle of the forks on a recumbent vehicle (20-30 degrees to the chassis?) puts the wheel pivot into a completely different axis. I can't picture how countersteering alone would work with a vehicles that's laid out like that. At least, not without being twitchy and unforgiving to input errors. That one's hard to explain without graphics (which I can't do on the computer I'm on at the moment). As long as you've got it worked out then all is well. I'm not trying to sound negative, but it's better that stuff gets worked out before spending the time and money prototyping it. It helps if you think of it as having two small forks, one on each wheel, just like a normal two-wheeler. The axis of steering rotation is still vertical relative to the horizon. It'd still have some rake in it. Look at the photo of the front end of the Brunelli Leanster I put in the thread earlier. You can see the steering knuckle and how it's actually locked in a vertical position. So turning that wheel is no different than turning the front wheel on your scooter. Ahh, I missed that when I was looking at it earlier. That'll work. It'll feel weird as hell, like you were saying. Should make for a fun ride, once you get a feel for it. I've had correspondence with Bob over at Tilting Motor Works and he says it's completely natural. Makes sense actually. If anything, it'd be more stable in terms of steering feel. What I'm most excited about is that on a wide-track tilter like this, it's basically impossible to low-side it, even in loose material. I'm sure that's why they took the pic on gravel. Actually, check this out. This is one of the early TMW prototypes on sand just sliding all over the place without ever low-siding. Cool. I rode an MP3 back when they first came out and it felt very natural after the first minute. If the recumbent setup works that well, it'll be a hoot to ride. I'd still build a running prototype that to test your front suspension geometry before you start fabricating pieces because, as every engineer knows, the devil is in the details. I'm really looking forward to following this project. Thanks for coming back to Modern Buddy and letting us know about this. I'll be building a small-scale but fully functional radio-controlled prototype in the coming weeks. That will work entirely on steering input, so if something doesn't work, it'll be obvious. Be sure to subscribe to the RSS feed over at ProjectStreetliner.com. I won't be posting many updates over here, but I'll be happy to answer questions and take ideas here. Okay, did the subscribe to RSS thing. On the RC protobike, be sure to get the steering geometry as close to exact as you possibly can. P.S. I love the looks of Design Concept Alpha. Things are coming along well. I'm starting on my first small scale prototype today, but what may be of more interest to you folks is some of the more recent design decisions about the overall shape and proportion of the vehicle. I'm having a great time with it and would love to get feedback or ideas on the design so far.